The new year will not bring with it any Sweethearts Conversation Hearts on the upcoming Valentine’s Day due to the fact that the company that owns the brand is still working on ramping up supply. These Hearts are among the most popular V-Day candies due to the fact that they come with words of love and courage and they’ve been around since 1902. In fact, the item has had the same formula since then, although they used to come in different shapes such as horseshoes, baseballs and watches. 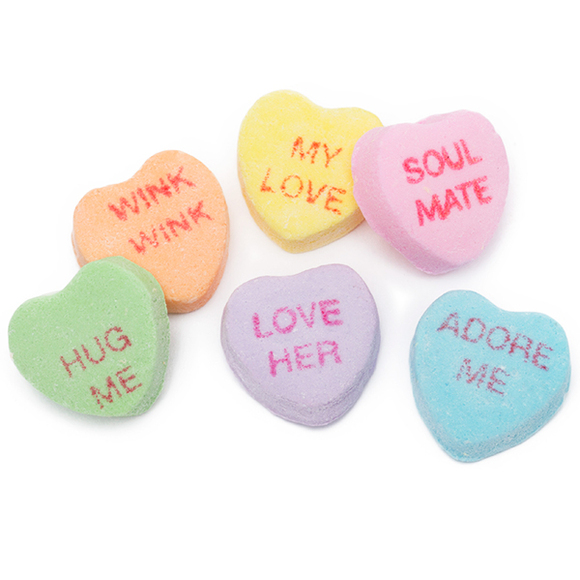 The company behind the Sweethearts Conversation Hearts is NECCO, the New England Confectionery Co., and they filed for bankruptcy last year, creating panic among fans of the candy, as well as Necco wafers and other sweets. However, the brand was recently acquired by Spangler Candy Co.
Spangler owns a number of popular candies in the industry, including Dum-Dums lollipops, Circus Peanuts candies, candy canes and Smarties. The company said that it has been working on upgrading its manufacturing facilities (DREAM BIG) but was unable to increase its production numbers in time for the love holiday following the acquisition. Nevertheless, you can still get out a sweet and lovely message to your significant other with brands like Brahm’s, as well as other alternatives such as Hershey Kisses, which now come with plenty of kissing-themed messages. Article printed from InvestorPlace Media, https://investorplace.com/2019/01/no-sweethearts-conversation-hearts/.